that we take the time to stop and listen? stars in my eyes and a song in my heart. repeating my worn-thin mantra of “you gotta do what you gotta do”. At this point, I honestly don’t know. I would have been enriched simply by the journey. may not be as safe as you thought. And someone thought these mushrooms were bacon! gently, until all the mushrooms are evenly coated with oil and spices. Adjust seasoning if needed. the halfway mark to see how it’s going. my condiments for a batch of this curry. I’ve also had them piled high on melted white cheese covered toast. juicy while the thinner outer edges become crisp. as an absolutely delicious condiment/side dish. a fried egg, and call it a full meal. I procured these lovely mushrooms from the Ministry of Mushrooms, which I’ve mentioned before. I really believe in supporting our local artisans…especially when they are as passionate about their produce as these fellows. not-so-good that is sometimes cloaked in sheep’s clothing. So onwards with eyes wide open friends! I want someone to make these for me! Yum! That looks sooo good, Jo! I have always felt slightly guilty about sticking with buttons and,portobellos instead of patronizing the local stuff. Just never really sure what to do w/ oysters. Until now! Oh, and I'm a BIG believer in signs, being still so you can hear (and trust!) the wisdom of your heart, and Desiderata–"Whether or not it is clear to you, no doubt the universe is unfolding as it should." Stay fabulous! These look so yummy! Never thought about roasting oyster mushrooms. Thanks for the inspiration! A great idea! They look so scrumptious. Looks great and delicious, good job guys, keep it up and thanks for sharing this wonderful recipe. Hi Jo! This recipe actually works best with oysters because their thin edges get crispy, something you won't really get with button or portobellos 🙂 Thanks for the wise words!! Thanks as well Indian Chief! This looks sooo delicious! In my book, bacon is tops as well! Mushrooms come in close, though. Mushrooms that look like bacon? A dream come true! I can just taste its smokiness now…Good post, Joey! If I hadn't seen the title of this post, I would have totally sworn these were bacon scraps! Wow! Wow!! I am so mesmerized by this recipe. 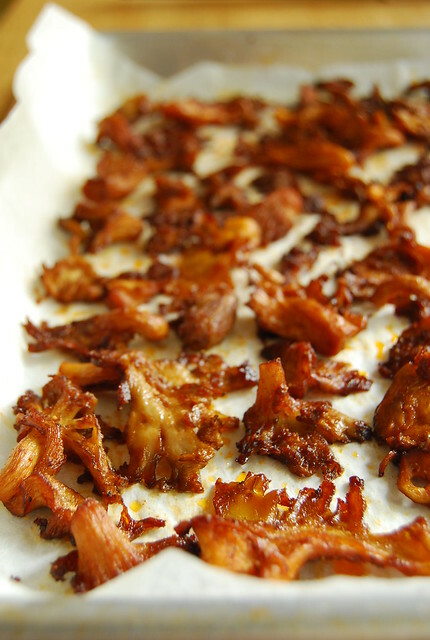 I do not like mushrooms at all, will not touch them, but after seeing this recipe, I will definitely try these. I love all mushrooms and having them this way sounds wonderful… I do believe in signs, even though I sometimes ignore them. Afterwards I always wonder why I didn't trust my instinct or the signs more! Hi Jen! Thanks! I love them this way…so different from how mushrooms are usually prepared! And it really does make a very good bacon substitute in my opinion…not that I would ever substitute bacon!! Hi Vshaw! Hope you do try it out! I thought those were bacon too even after reading the title. I had to scroll up and and down quite a few time to make sure, Haha. Shockingly, I've got no dulce pimentón left in the house – only the piccante version. Need to remedy this soon. While we do have excellent wild mushrooms over here, the season is soon over (night frosts and snow are on the way! ), and then we must settle for cultivated ones (like oyster mushrooms). You had me at bacon….even if it really isn't bacon. haha Great recipe! By the way, I use the lemon slogan on my site, but instead of stcking them in my San Pellegrino, I just grill 'em. Something my vegetarian sister-in-law and I (carnivore) can enjoy! i got there to check out cool food pics and they link me to recipes or food bloggers. Anywho, great site! Can I substitute cumin powder for the seeds?